Hyssop-Leaved Water Primrose is an erect herb or undershrub, usually growing in marshy places, hairless, branches narrowly winged, quadrangular. Leaves are alternate, entire, up to 6.5-7.5 cm long, 1.2-3.0 cm wide, ovate-lanceolate, tip pointed, base narrowed, leaf-stalks up to 5 mm long. Flowers are borne singly in leaf axils, on stalks with 2 bracteoles. Sepals are 4, lanceshaped, tip pointed, equaling the petals, persistent, tube narrow, upto 5 mm long. 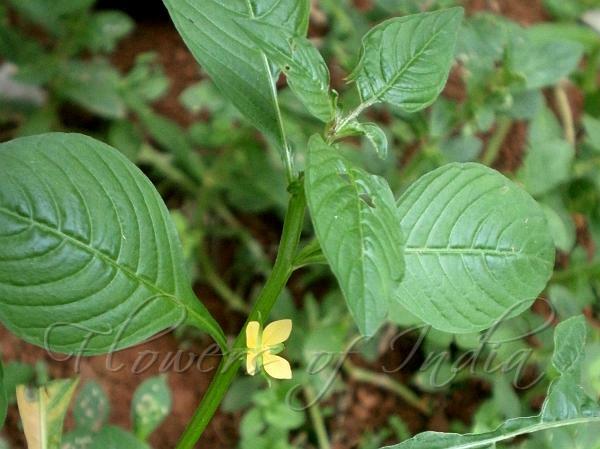 Petals are 4, yellow, ovate, base and tip narrow, 2-5mm long. Stamens are usually 8. Ovary is 4-celled, style simple; stigma head-like. Capsules are up to 2.5 cm long, subterete, enlarged in the upper part. Seeds are multiseriate in upper half, uniseriate in lower. 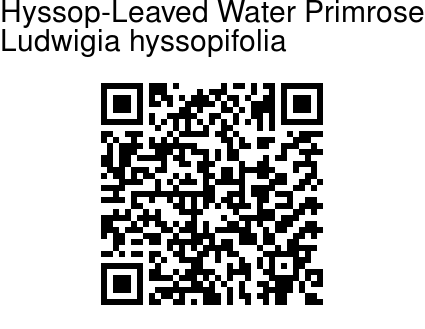 Hyssop-Leaved Water Primrose is a weed widespread across many continents. Photographed in Nekkarekadu, Vittal, Karnataka.